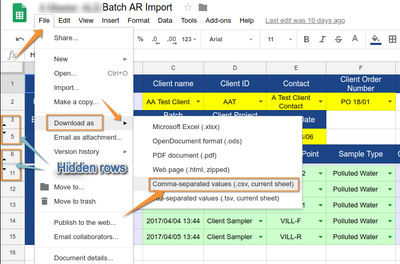 The data in the CSV are read into the system and validated, referencing the values for Client and Contact, Sample Types, Analysis Profile etc. The data are displayed an the upload indicated as valid or not. Invalid data elements are highlighted and the user has the option to correct the entries on-screen. Click Add, on the next screen browse to the CSV using the standard browser widget and click import. It takes seconds for the system to upload and validate the file entries. The file imported here has no errors, hence the status is valid. There are 2 options to fix errors - they are reported very accurately. 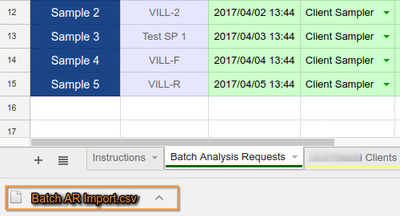 Once the Import is Valid, it Analysis Requests can be created from the upload. Click Import on the status drop down, see above screenshot.